V1025. BORIS SHTOKOLOV, w.Popov Cond. 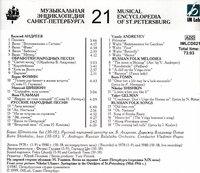 : Russian Folk Songs; Songs by Andreyev, Fomin, Shishkin, Gelman, etc. (Russia) IMLCD 021, recorded 1978-80. Long out-of-print; final copy!